Pamper yourself with the luxury you deserve. 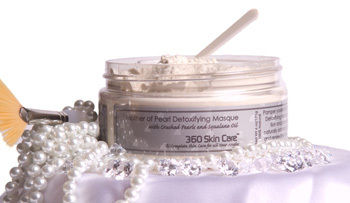 The Pearls in 360 Skin Care’s Mother of Pearl Detoxifying Masque are rich in amino acids, minerals, calcium, which eases inflammation and promotes healing. Squalane reduces the appearance of wrinkles while naturally occurring Lactic acids, proteins and vitamins found in Coconut Milk strengthen and renew tired skin and encourage cell regeneration. Paint brush and instructions included. Devised for use on all skin types.